In light of our recent Space Chat, this article from USA Today's "Drive On" automotive blog is worth noting. Far fetched? Check out this gripping lead. 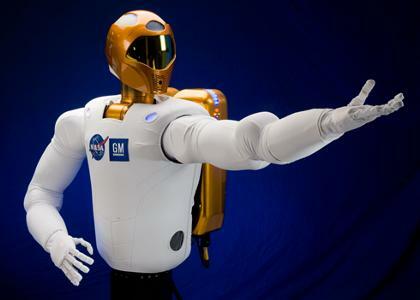 The GM/NASA "Robonaut." Explores the universe, gently cups your balls. Boom. Robonaut. Like we just thought it into existence. Sadly, the author seems more concerned with joking about the Robonaut's physique than providing any actual details (or fact-checking, for that matter).